Up your gardening game and grow a naturally layered garden of different flowers. Backyard landscaping options are endless. From a paved basketball court to an English garden, designing your perfect yard means planning ahead, doing your research, and creating a timeline. A full, naturally-looking flower bed, for example, requires some foresight in order to ensure each plant has the best growth opportunity and that the placement of your plants gives you the outcome you desire. When planning for a layered flower bed, keep an end goal in mind, maybe even printing a picture off of the internet or tearing a page out of a magazine as your template. The goal is to create layers of color and texture in your flower bed so the first step in the process is to invest time in some research. In the long run, this will be the most important step to save you time and physical work down the road. Start with the USDA Hardiness Zones map to find out what region you fall into. When choosing plants, make sure the ideal growing region matches yours. Grab a notebook and list the flowers you love and you’ve identified as sustainable in your region. Next to the name of each plant, list some information about it. An online spreadsheet is also a great tool for this. Columns of information should include planting time, germination if applicable, blooming season, length of blooming season, spacing requirements, and overall maximum size of the plant including both height and width. Also identify color options so you can coordinate with plants around it. Backed with information about each plant, the design portion begins. You can sketch out a design freehand, use graph paper, or have fun with an online graphic design program. However you decide to record it, the important thing is to have a visual plan for your flower beds. This will save you from transplanting plants when they get overcrowded or buried beneath another plant. 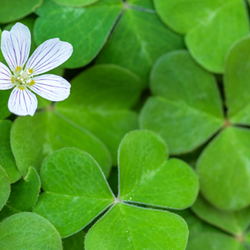 Your plan should start in the front of the flower bed with low-to-the-ground options like groundcover, crocus, succulents, and blue star creeper. Decide whether you want the plants to overhang the front of your garden bed or if you want to keep them from encroaching on the mow strip. Always plan for the maximum size of the plant. Although things might seem a little empty in the beginning, you will thank yourself when you plants reach maturity. In the meantime, you can also fill in blank spots with bird baths, sun globes, windmills, potted plants, and other yard decor. Another option for “holes” in your flower bed design in a standing hook with a flower basket that you can move to a different location later on. 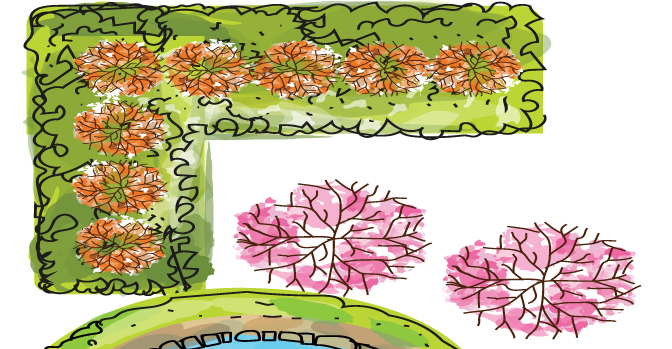 Back to the sketch, move back a row from your ground covers and design the space for the smaller or shorter plants on your list like geranium, begonia, woodruff, and short grasses. 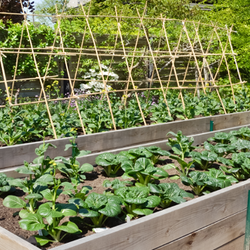 Plan to plant groups of three and avoid making straight rows for a more natural flow. These plants should have a maximum height of less than one foot. Be sure to leave adequate space between plants for growth. 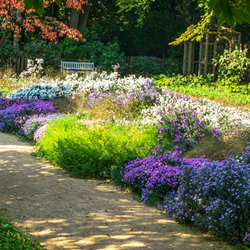 Next move into the row of one to three-foot plants like hyacinth, lilies, gaura, and daisies. Behind that, go for the striking shrubs intermingled with tall thin plants. For your back row include tall sunflowers, canna lilies, or hollyhock as a backdrop against the fence. When deciding on the plants for your bed, make sure you have a combination of types. For example, include some shrubs and perhaps a small tree along with reliable perennials, herbs, bulbs, and some annuals for a splash of color and an opportunity to fill in seasonal holes. Speaking of seasonal changes, you’ll need to consider how your layered flower bed will change from spring through winter and design it with that in mind. It’s great to overlap plants to take over for each other as the seasons change. For example, place tulip bulbs and asiatic lily bulbs next to each other so that when the tulips die back, the lilies are pushing through. Also remember that many plants can be divided as they grow which provides additional plants for that space or another one in your yard. Divide daylilies and hydrangea very early in the season or at the end of the season before there is any chance of a freeze. When it comes to purchasing your plants, there are myriad options to choose from and you will likely use a combination of them. Visit the local garden center to see what they have available for immediate planting. For example, you’ll see mums out everywhere beginning in late August or early September and you can use them to fill any voids in your layered flower bed. Perhaps you want to pick up bulbs at a box store like Costco when they are in season or you can order them online. Nurseries in your area are another great resource since the owner is typically enthusiastic about sharing growing information, the plants growing in the same area as you are likely to do well in your yard, and you have the opportunity to match plants with your preferences. While it is great to sip sun tea while admiring your beautifully tiered flower garden, it does require maintenance to keep it looking fresh and lively. Of course each plant has its own requirements, but generally you will want to create a plan for regular feeding. Watering is crucial and can be done by hose, sprinkler, or soaker hoses. You can even hook up the watering system to a timer for convenience, especially when you are away from home. One of the most important things to realize about layered beds is that it is filled with living items that may not always perform exactly as expected. Be prepared to make adjustments throughout the season and into next year as smaller plants get overtaken by a bushy neighbor, or the bulbs fail to bloom. Keep a master diagram tucked into one of your garden books and update it as you make changes so that you remember what plants need replaced or thinned next year and where you have a void from a plant you pulled at the end of the season. With planning and research, creating a layered flower bed that matches the image you found in a magazine is completely attainable. Remember to enjoy the experience and take pride in your hard work.